"A really compelling opening, one of the most powerful hooks I've read in a long time. The story is gripping and fast paced. The scenes zip along with provocative dialogue. The plot is a 5 out of 5" - Reviewer from Writer's Digest. Evil Exchange by Lori Paris & Joe Soll, a gripping, deliciously readable novel, combines for the reader, the escapism of a true crime/suspense narrative – with the virtue of having experienced a vigorous, moral work-out. The theme is adoption, and the ripples of trauma that engulf families when an adoptee decides to search; and the main characters, painted with great care, navigate a common hidden darkness. . . that at the heart of every adoption reside issues of abandonment, loss, emptiness and guilt. Using the format of a lively, entertaining novel, with a large cast of characters; Paris & Soll explore the minefield of family life, depicting how emotional time-bombs can, and often do, explode beneath a well-ordered surface. 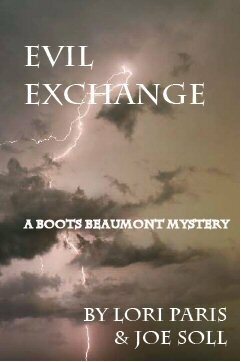 Evil Exchange is a must read socially meaningfulnovel, that sheds light on a complex subject, from multiple perspectives. - David Kirschner, PhD., Psychoanalyst, author of ADOPTION: Uncharted Waters... A Psychologist’s Case Studies... Clinical & Forensic Issues. Lori Paris and Joe Soll have devised a clever way to alert the public to a dark aspect of adoption: black market babies. This is an area of adoption which most people, including some who are victims of this practice, are unaware. Infused with intrigue and suspense, the authors lead us on a journey of kidnapping and murder for the purpose of procuring babies for unsuspecting American prospective adoptive parents. One of the unfortunate results of this practice is that, unlike the hero of this story, most of the adopted people in this situation will never be able to know their own heritage. Evil Exchange reads like a detective story, but has an important message to impart about a practice that is still going on today. - Nancy Verrier, MFT, author: The Primal Wound & Coming Home to Self. Evil Exchange is a fast packed action/adventure novel that is chock-full of intriguing characters and dangerous, life-altering situations. Ruthless criminals--willing to do the unspeakable--come to life in a baby-stealing adoption ring with shocking and often deadly results. The novel is informed by the authors' vast wealth of knowledge which clearly gives Evil Exchange its exciting edge. An intelligent and gripping work. Don't miss it. - Kari Caulfield, Attorney and author of Pretty Blue. Evil Exchange is a suspenseful, gripping novel that grabs you from the first page and keeps you on a wild ride from cover to cover. Filled with dark truths about the world of adoption, the authors weave a tale of intrigue, excitement and mystery that it is filled with twists and turns that keep the reader enthralled. The authors story involves the reader with such depth, allowing the reader to travel the journey along with the characters. The authors write in a "grishamesque" style and this book should be on the best seller list!!! Evil Exchange tells a gripping story about an Adoptee (Todd) who has always wondered, but taken an attitude of not caring about the longing and of denying those inner needs and feelings while doing a very intense and challenging job that deals with great danger and a Baby Ring where murder and kidnapping is a common end to the Mother and gut-wrenching heartbreak is a possible outcome if the Adoptive Parents and the actual Adoptee ever find out the truth. When a Baby Selling Ring is involved in an Adoption, there is almost certainly never a way for that adoptee to ever really find out where he/she came from and who the First Parents actually are. That is so very sad for the adoptee, because that bit of missing information is completely integral to them actually finding and making peace within themselves. I was ensnared from the first page of Evil Exchange, and found it difficult to stop reading when there were other things like taxes and resumes that took me away. The way you expressed Todd’s feelings of exhilaration and his acknowledging of the physical dangers involved as he worked the Empire State Building and the Twin Towers touched me. And my heart hurt when you told his story of the feeling of outsider-ness. I am glad he found Claire and the support group, and Diana. I was intrigued by the story, and also by the skill with which you both wove it. I could visualize the characters as you so aptly described them and let them develop themselves by their actions and dialogue. Your language was real, and yes, God bless you, it was a celebration of the word carefully selected for impact and understandable communication. I love the way you integrated your locales. Eleuthra, 74th Street, and Congers. I don’t know where the others rose from, your own experience, research, or your co-author. You owned the story so thoroughly; I’m not sure what contributions were made by whom. The story was seamless, and there was no way to know there was more than one author except for the banner and the attributes. It is great fiction, and a mystery John D. MacDonald would have been proud to have been a remote contributor. I want EVERYONE to read it! So, I guess that means that IT”S A MUST-READ! I want them to ask for it, and BUY it! I want a recognized personality to plug it on all the talk shows. I love the term first mother; it denotes the appropriate heart bond without taking away from the mother who adopted and cherished her child. Beside it, biological mother is so redolent of laboratories. Those who have their own stories will love you. Those who never came close to knowing will learn, and wait for your next mystery!.